An extrmely scarce pocket map of Staten Island, New York. Map of Staten Island Richmond County State of New York. A scarce large format pocket map of New York City's Staten Island. 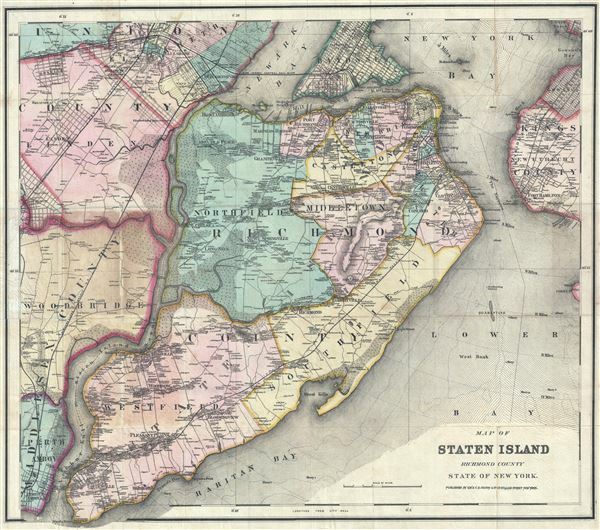 This is one of the few detailed maps of Staten Island from the middle part of the 19th century. The map covers the entirety of Staten Island from Bayonne and Perth Amboy to Brooklyn and Gowanus Bay. The whole is color coded by political district and all major streets and even individual residences are noted with landowner names. Topography is rendered in hachure. This map is extremely rare with only one other inferior example of this edition known - this being held at the New York Public Library. A later updated and revised edition with the same title and covering roughly the same area was issued around 1886. Very good. Removed from original binder (included) and professionally backed with archival tissue. Minor discoloration where attached to original binder - see image. Else a beautiful bright example. Rumsey 3093.002, 3093.001 (1896 edition). New York Public Library, Digital Collections, 5082512.